KG throws some 'bows (and shits his pants???). At the end of Boston’s Game 1 victory over the Heat on Saturday, Kevin Garnett was ejected for throwing an elbow at Quentin Richardson during a scrum after Paul Pierce fell to the ground with a shoulder stinger. KG claimed that Q-Rich was standing over Pierce and he was just trying to clear some room for Paul. ‘Two actresses’!!! I think I just fell in love with Quentin Richardson. The kind of love born out of a sense of deep respect between two men. “I just get surprised by people’s actions when I know them better than that. They’re not those characters they portray. They’re not who they say they are, Garnett and Pierce, they’re good basketball players and that’s about it. “I said to Jermaine, he’s OK because I knew nobody touched him,” explained Richardson. “Is he taking another break like he does so many times? Sometimes he falls like he’s about to be out for the season and then he gets right up, that’s all I said. Good stuff. Welcome back, Playoffs. 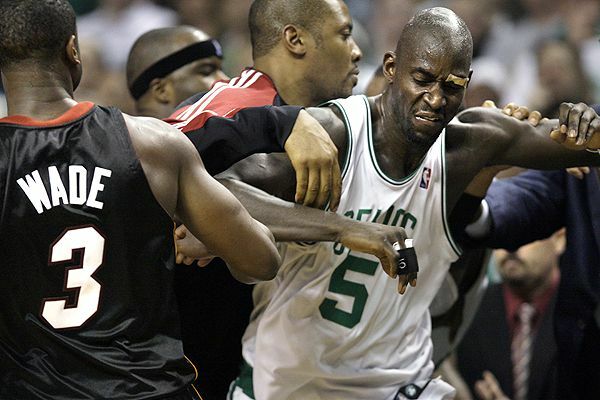 The league suspended Kevin Garnett one game for the elbow. But I’m sure Rasheed Wallace will pick up the slack.